Spray paint might be the fast and efficient way to get the job done, but it has a significant downside. Research shows that prolonged exposure to paint chemicals can potentially lead to long-term health problems. Asthma and skin allergies are bad enough but there are also lung cancer and brain damage to consider. The volatile organic compounds (VOCs) in the paint can even affect your reproductive organs and kidneys. And the list of potential short-term effects is long: from burning eyes and skin irritation to vomiting and diarrhea. You may well be familiar with some of these. You can minimise the potential risk by spraying in a well-ventilated room, but using a respirator mask is best. What Type Is Best For Painting? Many people make the mistake of thinking a dust mask can offer you sufficient protection while spray painting. While you can get some relatively sophisticated dust masks nowadays, they only protect you from particulates and not the vaporized paint chemicals and gases. Use them if you are sanding or mixing cement, but if you’re spray painting, you should invest in a proper respirator mask. Choosing the best respirator mask can be confusing. I’ve tried to simplify the choices available. There are two broad categories of respirators: air-purifying (APRs) and supplied-air respirators (SARs). The former is simpler; it uses a filter to remove contaminants from the air you’re breathing. An SAR, on the other hand, supplies clean air from a separate, uncontaminated source, much like scuba-diving gear. The ASR is the ‘big gun’, used in environments that are oxygen-deficient or where the contaminant is unknown. The APR is generally used in less dangerous environments. In addition, respirators can be divided into tight-fitting or loose-fitting. With tight-fitting masks, there must be a tight seal between your face and the mask. If not, chemicals can seep in. You must be properly fitted for a tight-fitting mask, especially in an industrial setting. This is important because factors such as facial hair or facial piercings can affect the fit. Finally, respirators are available either as half or full-mask, which I’ll cover later. All respirators in the US are graded according to the Assigned Protection Factor or APF. The APF describes the level of protection offered against the airborne contaminants. Simply put, the higher the number, the higher the protection. If your respirator has a grade of APF 50, it means it reduces your exposure is reduced to 1/50th the concentration of the contaminant. Everyone has their own preference and there are benefits to both. The full-face mask is heavier and bulkier than its half-face brother, but it offers greater protection against liquid splashes and noxious vapors. And this is your health we’re talking about. It is a bit tricky to fit this mask − you must ensure there is a tight seal around your entire face. This, unfortunately, means that you must be clean-shaven and must remove all jewelry and earrings before fitting it. If you wear glasses, you can get a special spectacle insert for the full-face mask. The insert will ensure that the seal is maintained. The half mask doesn’t offer you nearly as much protection but it’s much lighter and it’s much easier and quicker to fit. Its biggest advantage is that you can take it off and put it back on very easily. That’s handy if you’re going to be switching between jobs. But, because it doesn’t offer full coverage, you must wear goggles to protect your eyes. Unfortunately, there’s another downside to that: the goggles can fog up very easily. When it comes to my safety, I prefer to stick to a tried and tested brand, like 3M. The company has been around for more than a century. With its headquarters in St Paul, Minnesota, 3M supplies its worker-safety products to commercial and industrial consumers in more than 200 countries. Its 55 000-strong product range includes adhesives and electronic circuits as well as personal protective equipment. The latter ranges from respirators and hearing-protection products and air-monitoring devices, to environmental-safety products, and training programs. The 3M brand is synonymous with consistency, superior quality, and value. It’s a name you can trust with your safety. I found the 3M Comfort Quick Latch Half Facepiece Reusable Respirator extremely easy to use. It’s exceptionally light, about 500 ounces without the filters. You must purchase both the pre-filter and filter cartridges separately, which makes sense because you then you can use the respirator for other than spray painting. My favorite feature is the Quick Latch system, which makes it easy to slip the mask on and off. So, it’s not a hassle for you answer the telephone in the middle of a painting job. The mask fits snugly against your skin, soft but still firm. I couldn’t smell any paint while it was on, a sure indication that it was working. This respirator features 3M’s patented Cool Flow Valve which reduces moisture and heat build-up. As a result, I found I could breathe easily. It also has a nifty outlet valve that directs expressed air downwards, so it cuts down on fogging. I was a bit worried whether the mask would fit properly. After all, with respirators, it’s all about the fit. I ended up buying two masks. One in a medium and a large. They also have a smaller size available. At less than $20 each, it’s an affordable piece of protection when painting. So, now I know how Darth Vader felt. In fact, I think I know what my next Halloween costume is going to be. 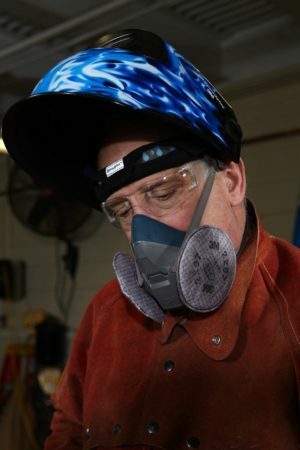 All kidding aside, 3M’s Full Facepiece Reusable Respirator 6700 offers fantastic protection. Yes, I struggled a bit to put it on and take it off, but I think that’s a small price to pay for overall protection. The straps are made of silicone so they can stretch without any fear of damaging them. I thought I’d feel claustrophobic but the lens is big enough to give you a wide field of vision. It also features the same Cool Flow technology so the air is kept dry and cool. And there is also little fogging. It was a bit of a hassle getting the insert for my spectacles, but well worth it. Of course, weighing in at 2 pounds, the mask is a lot heavier than the half-face respirator. So, to wear it requires commitment. I’d suggest planning for not taking off the mask until your spray-painting job is done, or at least until you’re ready for lunch. The mask meets all the US statutory requirements and can be fitted with a wide range of filter cartridges from a multi-gas vapor cartridge to a mercury vapor cartridge. I’m not sure you could use it as protection against a biological attack, but when it comes to spray painting, it does what it says on the box. At around $100, it’s significantly more expensive than the half-mask, so my budget couldn’t extend to buying two sizes. However, I followed the sizing guide from 3M and purchased a medium, which fits well. This model also comes in 3 sizes. In industrial operations which fall under the Occupational Safety and Hazard Act (OSHA), authorities recommend an SAR when spray painting. I think this would be overkill in your everyday DIY applications. An APR that is fitted with a pre-filter – to catch particulates – as well as a filter to stop the damaging vapors should be sufficient. Make sure the room you’re working in is well-ventilated. This will ensure the respirator operates more effectively. Change the filters regularly. They have a shelf life and become less effective over time. Check the respirator is not damaged before you use it. Always clean the respirator after use and store it in its original packaging for protection. Make sure the respirator mask fits properly. If you can still smell the paint, it is not fitting properly. To ensure there is a tight seal, hold your hands over the filters, to block the air, and breathe in and hold for 10 seconds. If you have a beard or other features that may affect the tight fit, it is recommended that you use a loose-fitting respirator mask. Always invest in the best protective gear you can afford, whether it’s the half-face respirator mask or the full-face alternative. When it comes to your health and safety, you can’t afford to take chances.